← Furniture DIY – How to Make Built-in PC Furniture! 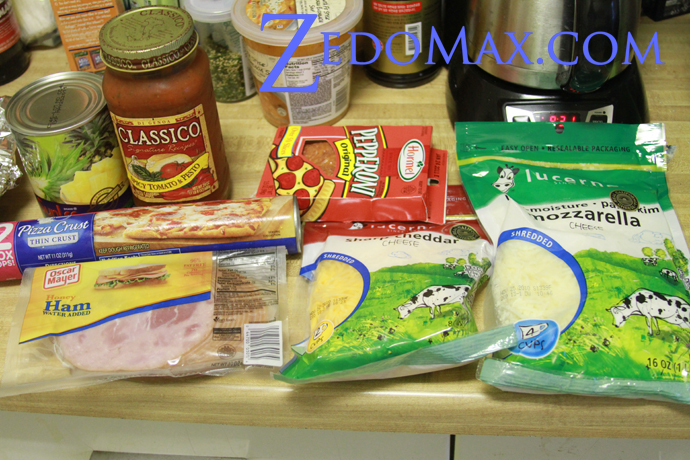 For those of you who have never made your own pizza from home, let me give you some instructions (from my years of working at Pizza Hut long time ago) on how to make some great pizzas. And trust me, this will taste about 100 times better than any pre-made pizza you buy at Papa John’s (yuck!). First of all, you will want to get some of the “right” ingredients as they will be crucial in making your pizza taste “restaurant” like. The most important part of a pizza in my opinion is the dough. If you use the wrong dough, your pizza can either end up soggy or just taste like crap. But, we are going to cheat a little bit here and not make the dough ourselves, also because making pizza dough can get a bit dirty and cumbersome. Instead, there’s a great pizza dough ready to be used called Pillsbury Pizza dough, you can buy at your local grocers. I usually get the “thin-crust” but if they don’t have that, you can even use the French Loaf version they have to and thin it out a bit. 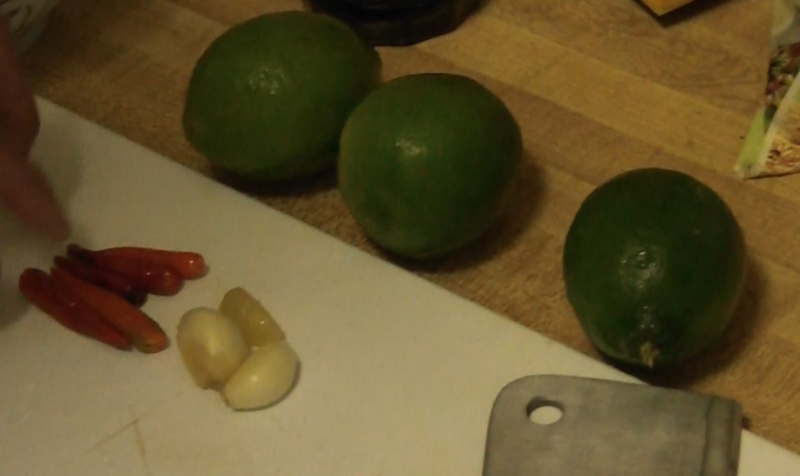 Secondly, you will need some good tomato sauce. I just used off-the-shelf tomato sauce made for pasta, just look for ones that are “fresh” and as red as possible. 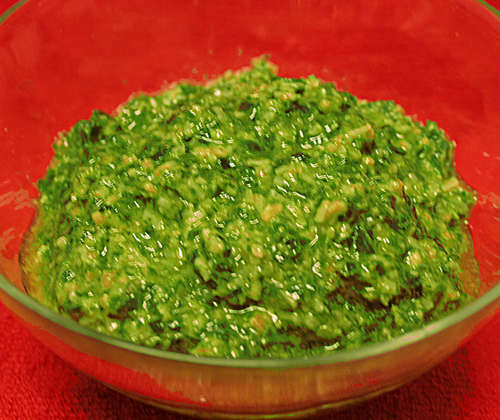 You can also experiment later with different sauces like pesto or even barbecue sauce. 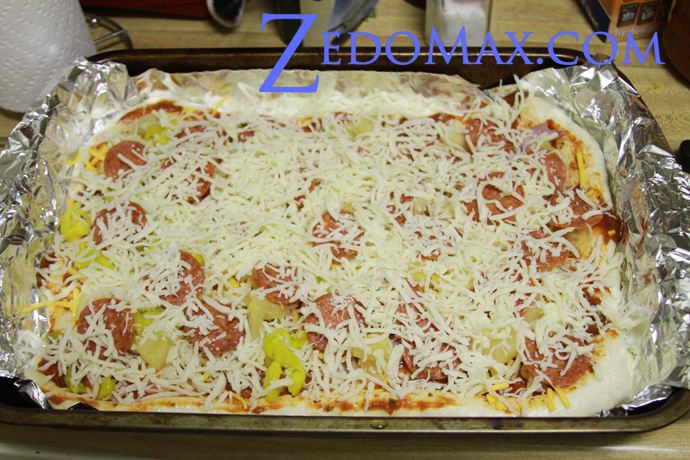 Third, you will need some shredded mozzarella cheese, you can get this pretty much anywhere. If you want to add a bit of cheddar taste to your pizza (which is also good for stabilizing all the acidity in the tomato sauce and also helps your teeth), get some shredded cheddar cheese. Fourth, you will need your favorite toppings whatever they are. 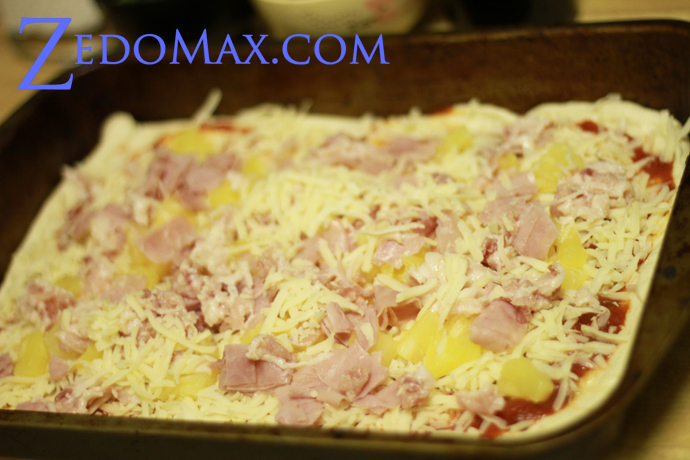 In this example, I made my own “Hawaiian Maui Zaui” with pepperoni, honey ham, pineapple, and pepperoncinis. First, put a thin layer of vegetable oil on your pan. Second, lay out your pizza dough on your pan. 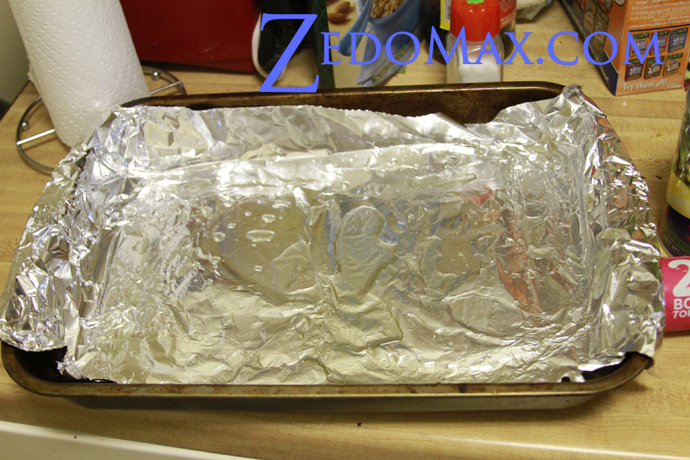 You can the outer crust part a bit thicker by rolling the dough a bit. 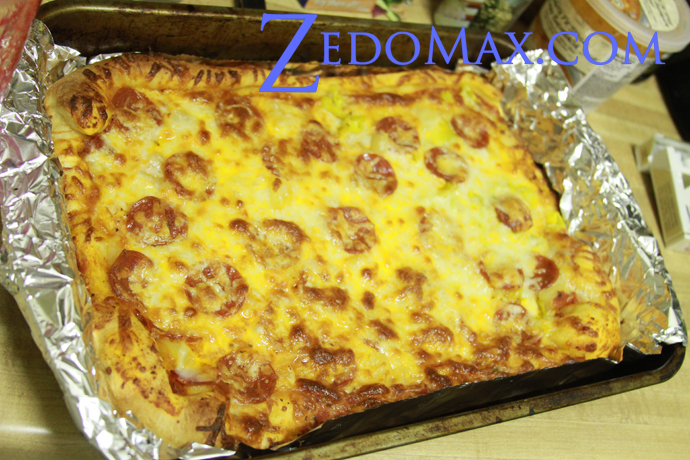 If you want to make stuffed-crust pizza, just roll some mozzarella or cheddar cheese stick all around your outer crust. I like making my pizza dough as thin as possible but you can experiment with that. Third, once you have the dough nicely ready, you want to put a “thin” layer of tomato sauce. Don’t over-do this part as if your tomato sauce layer is too thick, your pizza might end up a bit too soggy, you don’t want that. Fourth, once the tomato sauce is laid on nicely, put a little bit of mozzarella (or cheddar like how I like it) cheese layer over it. Fifth, put your favorite toppings on! You can also put all the cheese on first then put your toppings on. The reason why I put another layer of cheese at the end is because I like having extra cheesy pizza plus your toppings don’t go all over the place. Seventh, you can cook the whole pizza in your oven at about 410-425 degrees and check after 10 minutes. If you don’t see slightly brown cheese and dough, check every 3 minutes until the pizza is done. You can also vary the oven temperature and the cooking time to get different results but I like my pizza pretty crusty so 410-425 degrees is optimal for a crusty pizza, plus your pizza cooks quick. 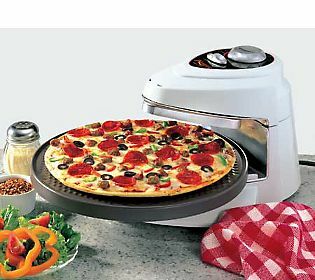 Finally, keep trying different sauces, toppings, and you can create your own pizza. 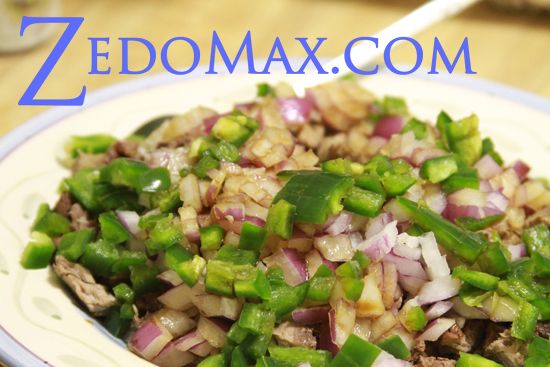 Check out more interesting categories: Cooking, DIY, Entertainment, Featured, Featured Entertainment, Food, HOWTO, Projects. 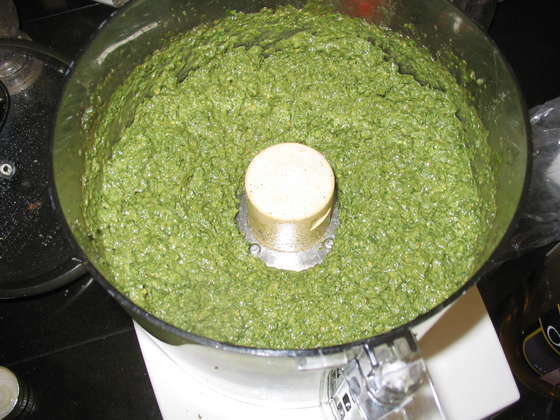 Food Hack – How to Make Homemade Pesto Sauce! 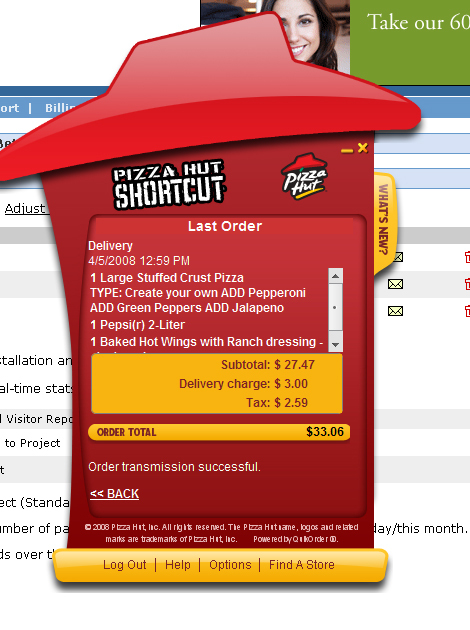 Pizza Hut Launches an Adobe Flex app!